Since New Mexico has some of the highest background radiation and UV levels in the country I would say that most of you should get as good or better results than this from your people. If not I highly recommend torturing them until performance and moral improve.. 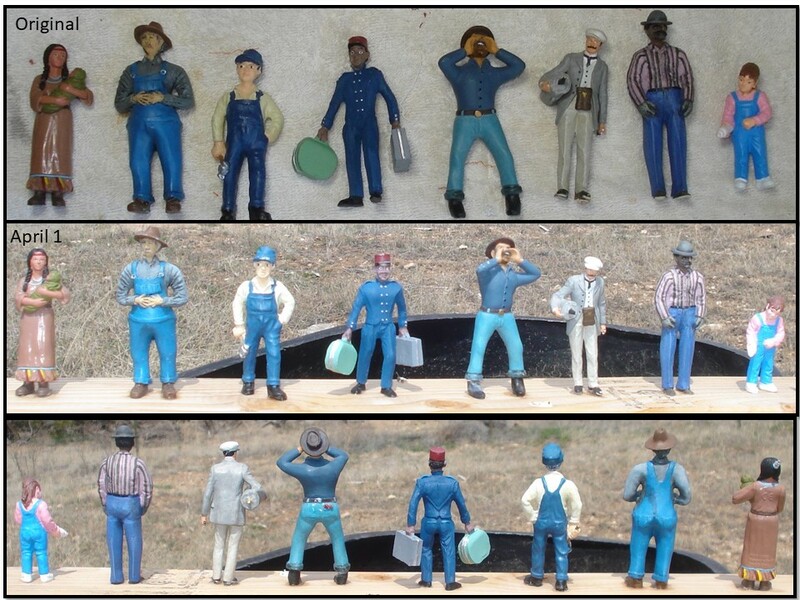 I have attached factory painted figures from 8 different manufacturers to a 2X4. Beginning New Years day they were placed outside in the yard where they are exposed to the elements, UV and public ridicule without any protection. They will remain there for the next year...maybe longer. Each month on or about the first I will take a picture and post it to this thread so everyone can see how they are holding up. 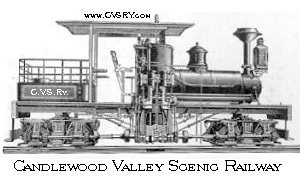 From left to right the brands are: Mojo (molded vinyl), Railroad Avenue (resin), Just Plain Folks (resin), Woodland Scenics (resin), Fun & Games(resin), Prieser (resin) Cheaple (resin) and Scleich (molded vinyl). This is science so you all need to take it serious. The lives of your figures just might depend on it. Does torture include waterboarding, scalping, electricity, or skin removal ? If yes will you video the proceedings ? 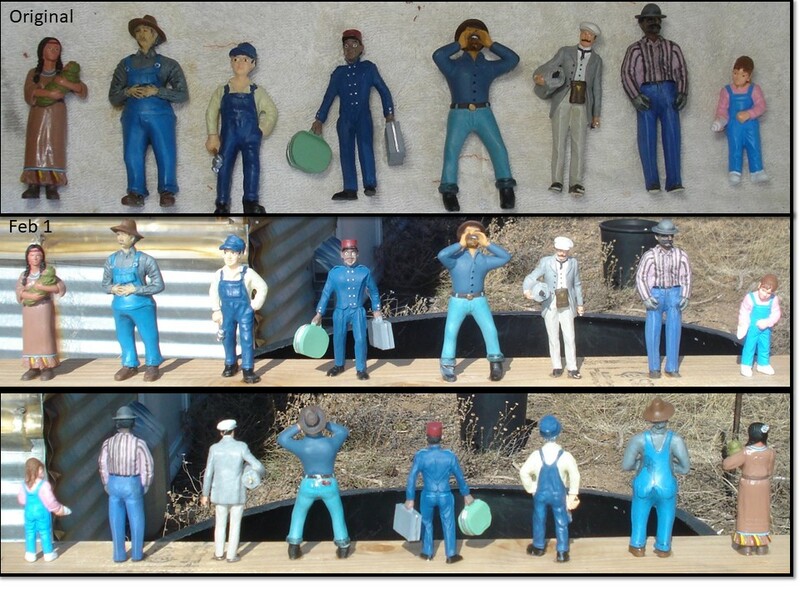 Did you use the same means of attachment for each figure? Was it all done with adhesive? Or was any mechanical means used, such as a rod up the foot/leg or other parts of the figure's body? This is a cool idea. I don't leave figures outside year round, but if I did this would help decide what to buy. One suggestion to improve the validity of your tests. If the 2x4 is movable, bring it indoors to photograph each month where you can control the lighting keeping it constant for each progress shot. Outdoors sun intensity, or lack thereof will artificially change colors in a photo. What looks washed out and faded in bright sun, may actually be brilliant color in proper light. Also - it would have been good if you got your "before" shot after mounting in the same environment as the Feb 1 pics. But since you may not have, comparing to Feb 1 as you go along may give a better comparison. I agree with Jon, all us scientists ( and people who stay at Holiday Inn Express) and lowly truck drivers know to control the variables, so hurry up and take a picture inside today and try your best to take all pictures in same spot with same lighting and same camera, otherwise we will disavow any knowledge of your experiment and any conclusions you form. Did you notice any differences on the one month mark? If you noticed, the top row was original. But, it was a picture taken indoors and so the lighting isn't the same. It appears, probably because of the difference in lighting, that the reds and browns have faded somewhat. Wow thanks for the great comments guys. I did not expect there to be much interest until way later in the year. I will address a couple of them. A longer explanation is on the website if you want to follow the link above. Rick the figures are all glued to the board using a healthy glob of E6K. A bird or something must have attacked the lumberjack as I found him on the ground broken off at the ankles on day 2. He has been super-glued back on his feet. There are no variables in the test. All of the test items are being subjected to the same environment at the same time. What is variable is the quality of my photography. I am using a 15 year old Sony Cybershot 7.2 digital camera. You can buy a brand new one with all the accessories for under $20. That should be an indicator as too its capability. The pictures below were taken with the camera just seconds apart. You see the variation in lighting. Why? Flash shutter out of sync. Sensors for the auto focus old and or just old tech. Who knows. I compensate for this by taking lots of pictures and choosing the best one. Why don't I replace it? Well most of you are old and old tech and I don't replace you. Although if Pete drives by my house one more time and does not stop in for BBQ and trains I may replace him. Yes I could have taken the first picture outside except we had three feet of snow the day after Christmas and I did not feel like wading through it to get a pic. I could bring the figures in each month but I feel that is unnecessary as well. I think the deterioration is going to be obvious. Here is an example. The fuel tank is new and has never been outside. The trunk was once primed/painted brown (resin was originally the same as the tank) and set outside for about 3 years. If any figures should by some miracle shrug off the wrath of the sun god and make it a full year with little discernible damage then I would say buy product from those manufacturers with confidence. 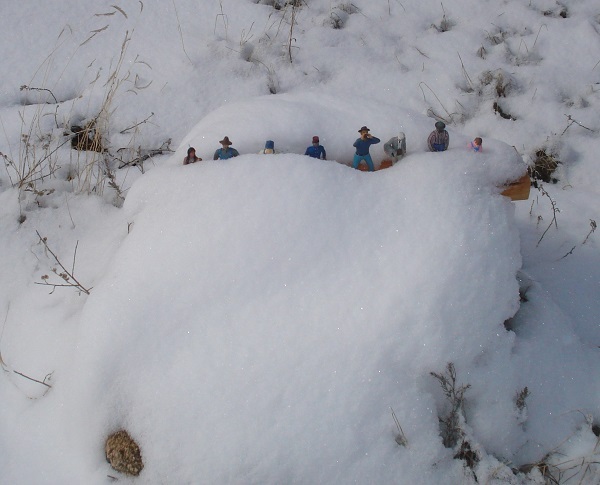 Please feel free to post your own pics and experiences here in regards to figures or details enduring the elements. Neat idea. I wish I had done something simiilar for the ones I have painted - and document the paint that I used. Tree rats is probably it, now that I live in the city limits it sorta cramps my shooting them. Weather: single digits overnight with day time high in the mid 20’s. Five inches of snow. 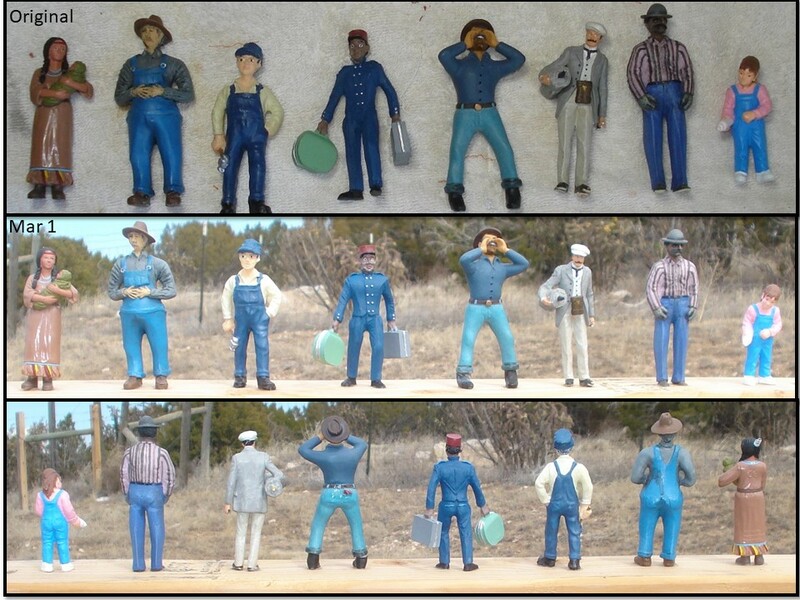 Being a figure on the Cibola is no job for those fainthearted plastic cowboys from the grocery store. Out here, those that can,.. DO! …and those that can’t? Well they wind up in somebodies display cabinet being eyeballed by one or more curios kitties. That fought with us upon Saint Crispin's day....Eh more or less. It is overcast here so the gang looks lighter in color than they really are. Looking at them up close in person I think the blue hues in two if not most of the resin figures is showing signs of fading. I will know it is for real when they start to get oxidation on them. My jeans are fading, also. Three figures are showing flaking on their hats and other sharp edges. Interesting! Thanks for the posting.